Just time at present to test drive without photos (sorry). New Haven version. Great bargain at under $300 from Charles Ro. Operates pretty much the way they all do--terrific. Looks pretty much the way they all do--very nice semi-scale. Highly recommended for those who like bargain command control semi-scale locos that are compatible with any layout control system--conventional/command/battery power. Command control with no additional purchases (except batteries for the remote--3 AAAs) needed. Those look very nice in the catalog! Looks even better in person . I've been eyeing these since they were cataloged last year. Probably will get the Virginian livery. Currently playing a bit of the pricing game and am watching a couple of dealers. Thanks for the comments. Sounds like another LC+ winner for Lionel! As much as I like LC+, I'm not a fan of the Rectifier only because it doesn't smoke. What can I say, I like the smoking. I would try it out though. They are sort of odd looking ducks, but I'm still going to get one. 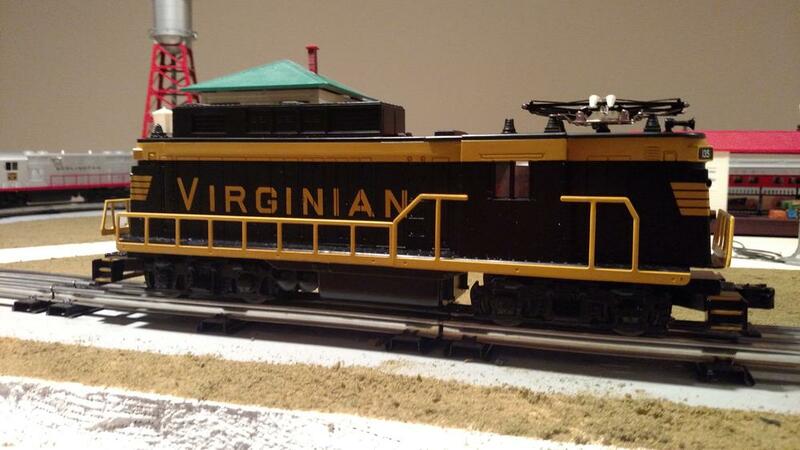 I like the Virginian as it harkens back to PW Lionel. I like it! I wish it was scale. I like the NH or Virginian livery. I think the price point for this type of product should be around $199 to attract more buyers. Just my opinion. They'll get there -- if you wait. Keep an eye on various train dealers. Mario's Trains, to cite one example, has had some pretty good prices on Rectifiers. He's also a forum sponsor. This thread answers a question I had- the lionchief plus versions do not have smoke. 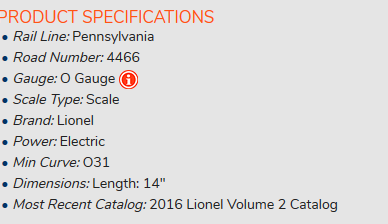 The lionel web pages on these rectifiers all mention smoke units and I wondered whether there was a diesel generator or something buried in the real ones for an unspecified purpose. Didn't make sense to me. As much as I love the virginian RR and rectifiers, I love smoke too so I am probably with dennym. If you drive a Jeep, you need not ask, if you have to ask...go drive a Jeep! I got the NH one, and it's great fun. I have a simple 8 x 12 layout with 2 independent loops and a ZW. My son and I used to just set the throttle and watch. Now he's walking around making it start and stop, firing the couplers etc. He's young, but really enjoys the fact he's operating it. We've also had some fun putting two Lionchief engines on the same loop following each other. That really gives one insight into why TMCC or DCS might be a worthy jump. Even if I don't, it has me thinking about what track arrangements would keep the interest going (passing tracks). Already, just the Lionchief remote control makes running two trains on a single loop interesting - in the limited space you have to throttle up slowly on both and watch your distances. I agree with the other posts - we have a Santa Fe Geep that smokes and it's great fun. The one I have is the ACL, I wish Lionel would expand the RS-3 or switcher offerings to flags I collect. They look sweet too. If an electric smokes, it is either coming from the steam generator in a passenger unit, or something is frying in the electrical equipment! I'm looking at the Contrail Lion Chief rectifier at the moment, hoping to make a purchase soon. Electric locos have always been a favorite of mine, over steam and diesel. I like seeing them run under live catenary. When I finally get started on my layout, I will build a catenary system similar to what I had many, many years ago. There are or should I say, were a multitude of electric locos in the real world. There still are in Europe. A lot of them have been reproduced in O scale, three rail. I'd like to see more in semi-scale however. Some of the offerings from MTH, that I know of, are too pricey for my wallet. 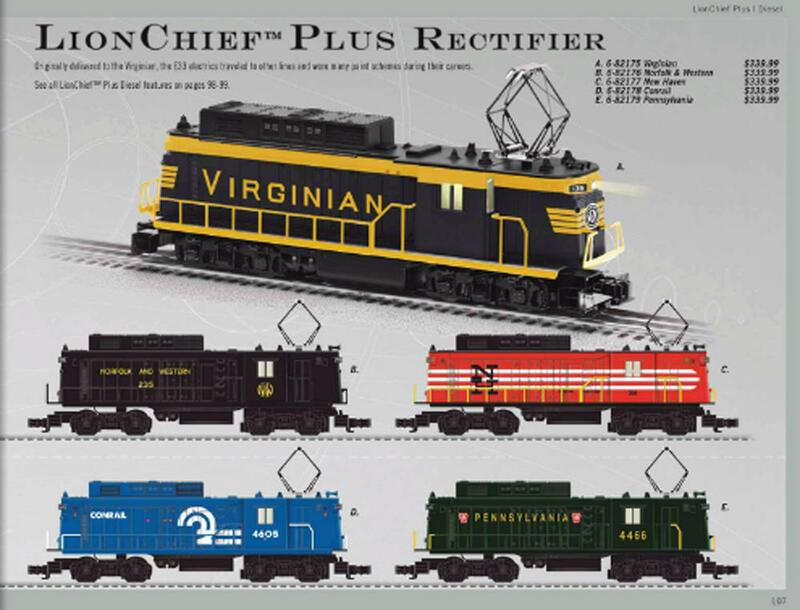 Just got my PRR Rectifier, my first Lion Chief locomotive. Overall, a nice locomotive except for the fact that the LED light on the short-hood headlight is not centered properly behind the lens, making that headlight darker. The shell did not seem to be fully down on that side, so I repositioned it which helped some. I'm afraid to try and "bend" the light assembly, it seems pretty fragile. I'll look at it some more, but may end up operating it long-hood forward. An addition to the Lion Chief Plus roster. The Virginian Rectifier. Several road names out there but I liked this one as a nod to Lionel PW. Will this run on an O27 layout? It runs on any track. It only needs a constant 18 volts. When you buy starter sets, they often come with a loop of track and a simple wall plug transformer that barrel plugs into the track. When you buy an engine only such as these, you can use a standard power pack by setting the throttle to 18v. If you already have a command control system, you're done - you have 18v on the track already. TrainWorld has had their rectifiers on sale for $160 for some time now. Offered in Virginian, N&W, NH, Conrail and PRR livery. A steal if you ask me - I have a PRR, runs great. Good point. I was considering the term "O27" in the vernacular. For the sake of precision, it might not go through 27" curves. On my PW-style layout it runs fine on my O-31 curves. However, I have a multi-level layout with 4 tunnel portals and the geometry heading into those tunnels makes this one a very tight fit. I ended up buying a New Haven version. Great looking model for $159 👍 .. I ordered the Virginian today, great price.